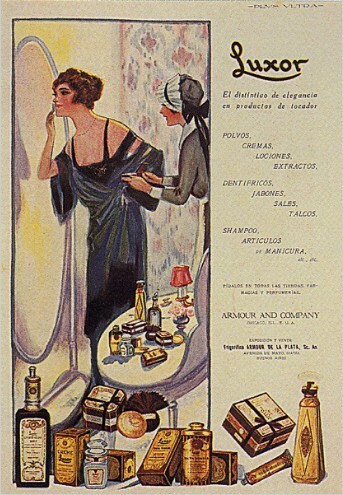 “Productos de Belleza Luxor,” 1918. Image courtesy of WikiCommons. When the editors of The Recipes Project invited me to compile a series on beauty and cosmetics, we thought it a timely topic for the holiday season. As twenty-first-century consumers, we associate the holidays with the careful selection and purchase of gifts. 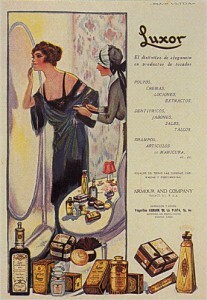 These are often of the luxury variety, including wares that beautify recipients: scents, cosmetics, grooming products and tools. While we typically purchase these goods, historical gift-givers relied on recipes to concoct homemade offerings. Foodstuffs and preserves, healing remedies, and potpourris helped forge social bonds and convey good tidings. But research shows us that beautifying goods were not always associated with luxury. Up until the twentieth century, beauty recipes served a variety of functions: as medicines, to conceal age, to disguise debility. The research featured in December’s special series on beauty is no exception. Rather than highlight the relationship between beauty and luxury, our contributors foreground quotidian uses of beautifying goods as medicinal aides, dangerous but necessary appearance enhancers, or professional tools of the workplace (in this case, the theatre). This means, of course, that we have expanded beyond holiday-appropriate themes of luxury and exchange. Instead, contributors Montserrat Cabré, Kirsten James, and Sean Trainor introduce us to the multiple meanings and uses of beauty recipes — even those with potentially deleterious effects. They also remind us of the close historical linkages between cosmetics and other beautifying goods in western beauty cultures, as perfumes and hair tonics were produced alongside powders and paints. Ultimately, a focus on function over luxury highlights changing uses of beauty recipes from the twelfth century, not to mention western attitudes about self-fashioning more generally. We hope you’ll join us this holiday season as we explore the “serious” side of goods now associated with luxury and self-indulgence. And we look forward to hearing from readers working on historical beauty recipes across geographic locales and historical moments, so please get in touch via Twitter or in the Comments section!